This article is about the Jackson 5 song. For other uses, see I Want You Back (disambiguation). (Steeltown 1968) "I Want You Back"
"I Want You Back" is a 1969 song by the Jackson 5 which became a number-one hit for the band and the Motown label in early 1970. The song, along with a B-side cover of "Who's Lovin' You" by Smokey Robinson & the Miracles, was the only single used in the Jackson 5's first album, Diana Ross Presents the Jackson 5. It went to number one on the Soul singles chart for four weeks and held the number-one position on the Billboard Hot 100 singles chart for the week ending January 31, 1970. "I Want You Back" was ranked 121st on Rolling Stone's list of The 500 Greatest Songs of All Time. Originally considered for Gladys Knight & the Pips and later for Diana Ross, as "I Wanna Be Free", "I Want You Back" explores the theme of a lover who decides that he was too hasty in dropping his partner. 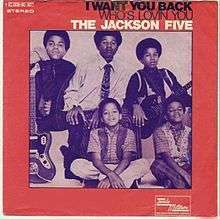 An unusual aspect about "I Want You Back" was that its main lead vocal was performed by a tween, Michael Jackson. "I Want You Back" was released on October 7, 1969 and was the first Jackson 5 single to be released by Motown and the first song written and produced by The Corporation, a team comprising Motown chief Berry Gordy, Freddie Perren, Alphonso Mizell, and Deke Richards. It also is the first of four Jackson 5 number-ones released in a row (the others being "ABC"-1970, "The Love You Save"-1970, and "I'll Be There"-1970) and the first Jackson 5 song recorded in Los Angeles, California; the quintet had previously been recording Bobby Taylor-produced covers, including "Who's Lovin' You", the B-side to "I Want You Back", at Hitsville U.S.A. in Detroit, Michigan. Although Gladys Knight had been the first to mention the Jacksons to Berry Gordy, and Bobby Taylor brought the Jackson brothers to Motown, Motown credited Diana Ross with discovering them. This was done not only to help promote the Jackson 5, but also to help ease Ross' transition into a solo career, which she began in 1970 soon after the Jackson 5 became a success. The Jackson 5 performed "I Want You Back" during all of their world tours, either as a full song or as a part of the Jackson 5 Medley in concerts (which also included "ABC" and "Mama's Pearl", later on switched with "The Love You Save" in 1973). During their second-ever television appearance (in an episode of The Hollywood Palace hosted by Diana Ross & the Supremes), the Jackson 5 performed "I Want You Back" along with Sly & the Family Stone's "Sing a Simple Song," The Delfonics' "Can You Remember," and James Brown's "There Was a Time". They also performed the song on American Bandstand and the Andy Williams Show. Michael Jackson performed the song as part of the "Jackson 5 Medley" (which also included the songs "The Love You Save" and "I'll Be There") during all of his world tours - the Bad World Tour, the Dangerous World Tour and the HIStory World Tour. The song was to be performed at Jackson's This Is It comeback concerts in London, which were cancelled due to his death. The song was performed live at the Michael Jackson: 30th Anniversary Special in 2001, in which Jackson reunited with his brothers on stage for the first time since 1984. It has sold six million copies worldwide. In 1999, "I Want You Back" was also inducted into the Grammy Hall of Fame. "I Want You Back" ranks number 121 on Rolling Stone's list of the '500 Greatest Songs of All Time'. It also ranks ninth on Rolling Stone's list of the '100 Greatest Pop Songs since 1963'. In 2006, Pitchfork Media named it the second best song of the 1960s, adding that the chorus contains "possibly the best chord progression in pop music history." A June 2009 article by The Daily Telegraph called it "arguably the greatest pop record of all time". Digital Spy called the song "one of the most enduring pop singles of the sixties". The single has been awarded Silver certification on August 22, 2014 by the British Phonographic Industry Association. ↑ "History 1969". Thejacksons.com. Retrieved 5 December 2015. 1 2 3 "I Want You Back". Rolling Stone. Retrieved September 25, 2014. ↑ "Archived copy". Archived from the original on 2015-11-19. Retrieved 2015-10-08. 1 2 3 4 5 George, Nelson (2007). Where Did Our Love Go? The Rise and Fall of the Motown Sound. Urbana and Chicago: University of Illinois Press. pp. 159–60, 183–188. ISBN 978-0-252-07498-1. ↑ "Jackson 5 | On TV!". Jackson5abc.com. Retrieved 2016-10-02. ↑ "Michael Jackson Average Setlists of tour: Michael Jackson: 30th Anniversary Special". Setlist.fm. Retrieved 2016-10-02. ↑ "Pop Review : A Cautious Return To His Throne with Air Kisses for Loyal Subjects". The New York Times. Retrieved 2016-10-02. 1 2 Boy bands throughout history. By Ed Masley. The Arizona Republic. Viewed 30 June 2009. ↑ "GRAMMY Hall Of Fame". GRAMMY.org. Retrieved 2016-10-02. 1 2 3 Michael Jackson and Motown: the boy behind the marketing. By Helen Brown. The Daily Telegraph. Published 26 June 2009. Viewed 30 June 2009. ↑ "Archived copy". Archived from the original on July 1, 2016. Retrieved July 18, 2014. ↑ "Archived copy". Archived from the original on 2016-10-03. Retrieved 2016-07-04. ↑ "flavour of new zealand - search listener". Flavourofnz.co.nz. Retrieved 2016-10-02. ↑ "Download French Single Top 50". France. lescharts. Retrieved 2009-12-31. ↑ Steffen Hung. "The Jackson 5 - I Want You Back". swedishcharts.com. Archived from the original on March 25, 2012. Retrieved 2012-03-31. ↑ "Top 100 1970 - UK Music Charts". Uk-charts.top-source.info. Retrieved 2016-10-02. ↑ "Top 100 Hits of 1970/Top 100 Songs of 1970". Musicoutfitters.com. Retrieved 2016-10-02. ↑ "Archived copy". Archived from the original on 2016-03-04. Retrieved 2016-07-07.